Whitefish Energy is the 2-person Montana company from Trump Interior Secretary Ryan Zinke's hometown of Whitefish, Montana that was awarded a $300M contract to help remediate Puerto Rico's shattered electrical grid, billing its subcontractors at $462/hour for supervisors and $319.04/hour for linesmen in a sweetheart deal that banned Puerto Rico from auditing the company's expense reports, or penalizing it for nonperformance. After widespread outcry, the governor of Puerto Rico demanded the termination of the contract, which has now happened. 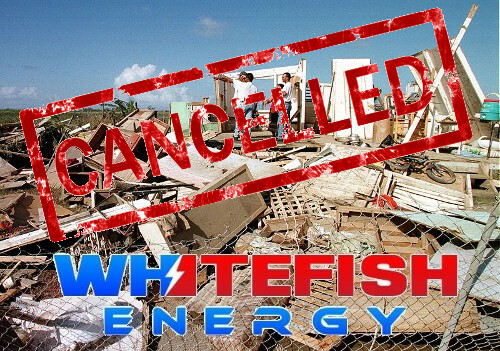 Whitefish's other contracts with the US government, states and territories are being audited. 70% of Puerto Rico has no power. It has been 40 days since Hurricane Maria struck the island. Secretary Zinke, whose son was employed by Whitefish as a summer job, denies having any role in awarding the contract to Whitefish.